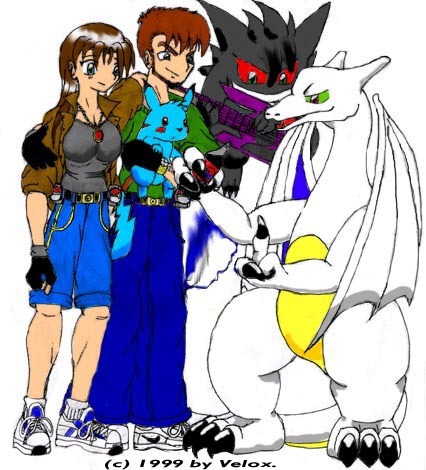 This is a picture of Kyle Richter, flanked by his six Pokémon: Thanatos (the shadowy Gengar), Grendel (the Aerodactyl who looks like he's about to eat Kyle's Pokéball), Fenris (the vigilant Arcanine), Ares (the Machamp who's dressed up decidedly like The Rock), Leviathan (the oh-so menacing-looking Dragonite), and the ever-lovin' blue-eyed Torrasque (the Scyther who's trying on Kyle's hat). 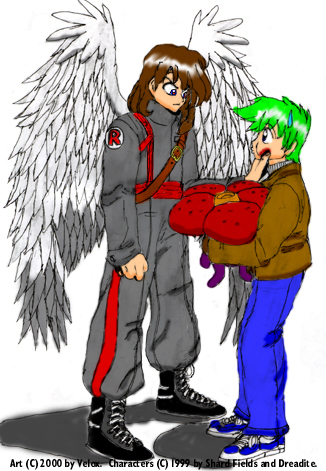 Here we see native Australian member of Team Rocket, David Bradley, with his Golem companion Goliath at his side, confronting Minax - one of the three people David hates most in the world (the other two being Kyle Richter and Dreadite). David is trying to convince Minax to quit Team Rocket by pointing a (secretly unloaded) gun at her in an alley beneath Silph Co. Unfortunately for David, however, Minax is not so easily threatened. After accidentally getting separated from her rival-turned-traveling-companion Kyle Richter, Jessica Sullivan is captured by the malicious cyber-raptor Panopticon. Jessica's Magmar - named Magus - is trying unsuccessfully to deal with Panopticon's shapeshifting C.O., Proteus the Ditto, who is seen here as a green Charmeleon. Here's a pic of Jessica Sullivan, reclining alongside her six Pokémon: Tendril (Victreebel), Alkaline (Muk), Seaclamp (Cloyster), Ermac (Porygon), Gigawatt (Electabuzz), and Magus (Magmar). Here's David Bradley showing off his guns, as well as his brand-new Walther PPK. Close by are his three Pokémon: Goliath the superintelligent Golem, who doubles as David's partner in Team Rocket; Clavicle the metalheaded Marowak, who wields the scythe of a Kabutops; and Rampage the bloodstained Rhydon, who's racked up more kills than Robocop. Espio the Charizard takes time out from journeying alongside Jessica and Kyle to discuss the finer points of Wild Cherry Pepsi, while Thanatos plays his restrung phantom guitar and Cathode the Pikachu wonders what on Earth Espio is babbling about. 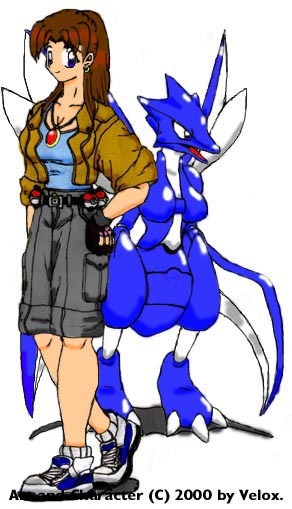 He's a filthy-rich were-Scyther, a relentless stalker of Jessica, and an all-around pain-in-the-arse. He's Vincenzo (a.k.a. "Enzo" or "The Italian Stallion") Larufa! 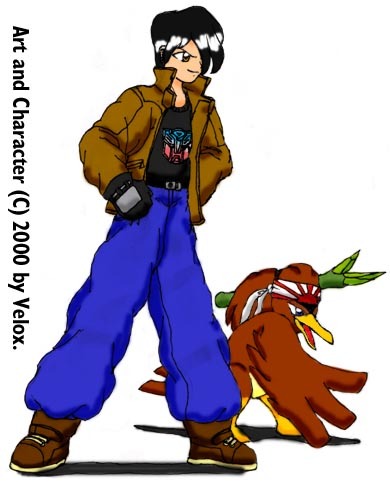 He's seen here with his egotistical Farfetch'd sidekick, Halberd. Try not to pay much attention to the poorly-drawn Autobot symbol on Enzo's shirt. Minax doesn't appreciate being stared at. 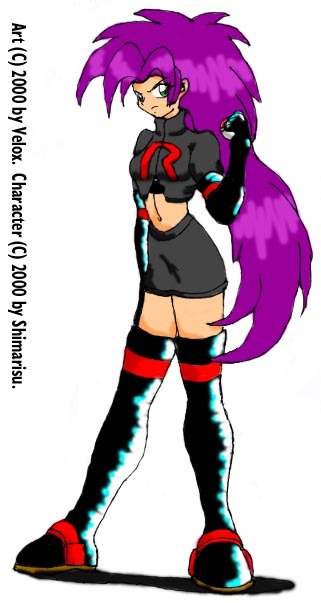 Here's a really-not-so-good IMO rendition of Murasaki. I think I was in over my head on this one. But at least I've finally cleared up all my PW! fanart obligations for the time being. 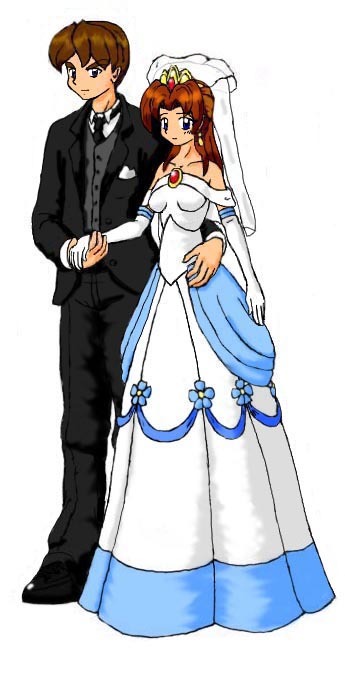 A pic that was destined for the cutting room floor, but was dusted off and restored.